All of us know that the thunder and lightning in the MCPE very rare, and because of this, players can not see the surprising creeper. With this addon everything will change. 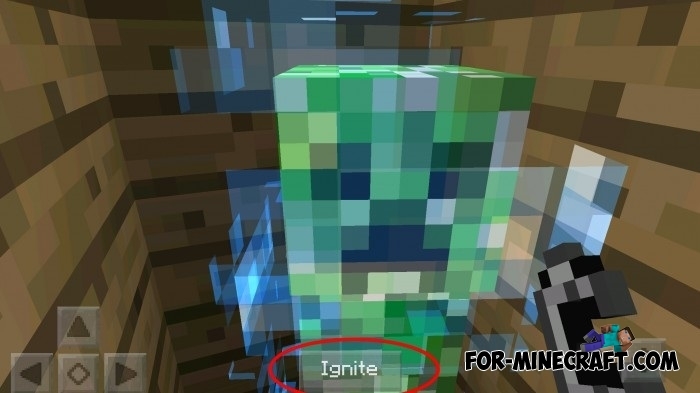 To charge the creeper, you just need to tap on it with a lighter. Just be careful, this green monster capable of many things. Monster Armor Mod for Minecraft PE 0.10.5 / 0.10.4Monster Armor - This mod allows you to make the armor that will give you new strength. Lightning Gem mod for Minecraft Pocket Edition 0.10.5With this mode, you can create a special power plants use energy as lightning and thunder. Creeper Gauntlet PE Mod for Minecraft PE 0.10.5This new mod will create a unique in-game item which will be another interesting feature. You can be charged from a creeper, and then create powerful explosions. More Creepers mod for Minecraft 0.10.4This mod will spawn all 8 new worlds Creeper. Each of their kind - unique. Ice Creeper will be left on the site of the explosion ice blocks, electric - a huge crater, etc.